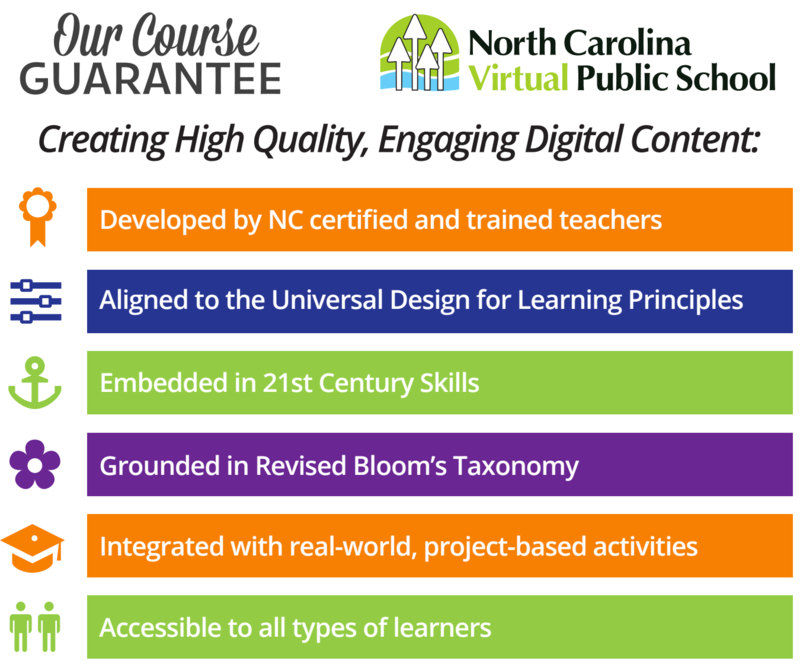 NCVPS courses are organic to North Carolina, created by teams of North Carolina teachers and virtual learning specialists. The courses are tailored to meet the North Carolina Standard Course of Study. They are not a canned, off-the-shelf product. They are a dynamic learning experience that is improved with continual development and revision. They have rigor, depth, diversity, and built-in supports to meet the needs of all students. Our courses include interactive learning objects, videos, audio recordings, infographics, images, screencasts, online demonstrations, and text readings that keep students engaged. Courses utilize real-time and asynchronous collaborative tools that connect students to their teachers and to each other. The high-quality courses use learning objects created with Raptivity or Articulate, which makes the learning interactive. Students have to click on something, mouse over something, type something, or say something for the object to work. Our courses are not passive-reading worksheets online. All NCVPS courses are hosted in the Canvas learning management system (LMS). Canvas is the premier LMS in K-12 education. It allows NCVPS teachers to have all their digital tools and resources in one place. It integrates seamlessly with hundreds of apps and makes teaching and learning more engaging and more fun. NCVPS uses leading educational resources to include Discovery, SAS, Khan Academy, Bozeman Science, and Gizmos. Course development technologies include Raptivity, CommonCraft, Articulate, Kaltura, Articulate, SoftChalk, Camtasia, UpSwing, and WebAssign. NCVPS has a partnership with the Virtual Leaders Learning Alliance (VLLA). The VLLA provides the opportunity to share courses with other state virtual schools. We have shared courses with our counterparts in Montana, Idaho, Georgia, and Arkansas. We also share courses with North Carolina school districts. This process is being streamlined with the statewide adoption of the Canvas learning management system. Watch this short animated video to see how our courses work. NCVPS courses are developed and revised by teams of North Carolina certified teachers with content expertise. Development teams consist of classroom teachers with subject expertise, LMS instructional designers, and content reviewers. EC and ESL specialists add differentiation and support mechanisms to the courses within our Occupational Course of Study and English Learner programs. All of our developers teach or have taught in North Carolina’s traditional brick-and-mortar schools. The content developers must be a certified North Carolina teacher who has met the Department of Public Instruction’s “highly qualified” standard or have proven expertise in the content matter and partnered with a certified teacher. The development and revision teams are guided by an instructional leader who oversees the creation of learning activities using media, games, animations, text, and digital tools. The instructional leaders work with the Curriculum staff to ensure courses are aligned to the NC or AP content standards as well as NCVPS design standards. The instructional leaders have experience in designing courses for a k-12 online learning environment and mastery of the Universal Design of Learning principles. Our teachers are at the heart of what we do. Our courses are teacher driven. We are not an online software program. All of our teachers are certified in North Carolina and have met the "highly qualified" standard established by the Department of Public Instruction before they can apply to teach with NCVPS. Teachers add fresh, dynamic content daily to meet the needs of their students. If the student is advanced, our teachers provide enrichment. If the student needs remediation, our teachers deliver the right content for that student at that time. For more on how teaching and learning works with NCVPS, visit our Teaching and Learning web page at this link.